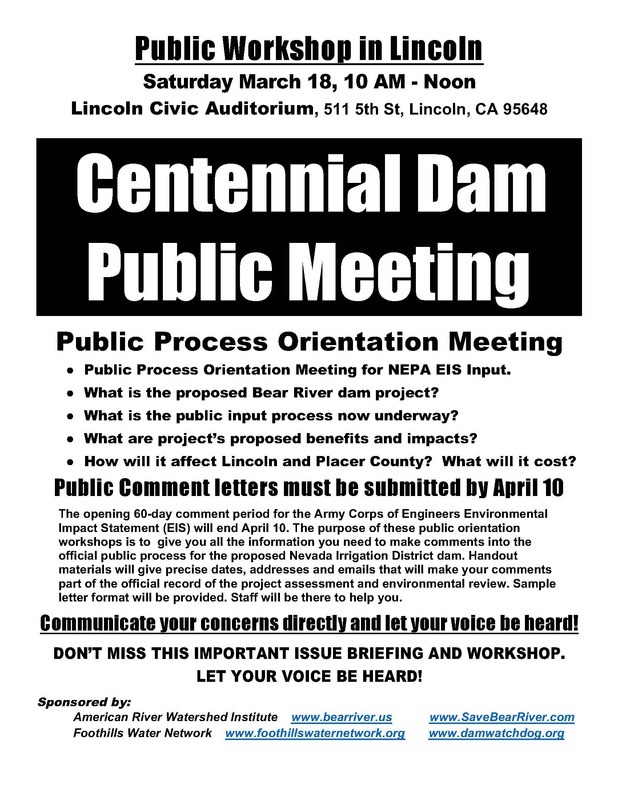 ALERT: Public Comment Letters due by April 10. 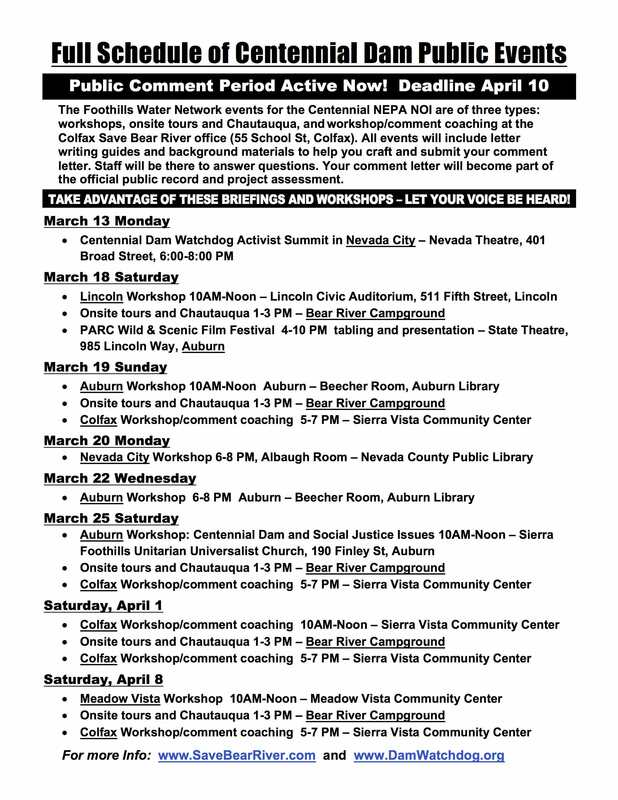 See schedule of Public Meetings, Workshops and Tours below. 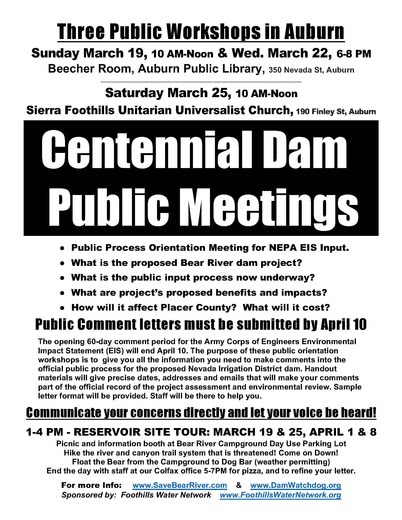 ALERT: NID's Centennial Dam project is now in the federal Environmental Impact Statement initial comment period. We all have the opportunity to make a clear statement of concern to the Army Corps, who are in charge of the comment process. Making a comment now gives you officially recognized standing in the process, and NID has to respond to your comment directly in the Draft Environmental Impact Statement expected Winter 2018.
Letters are due by April 10. 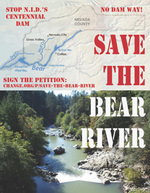 Bear River advocates are sponsoring a series of workshops to help you understand the issues and the process, and to craft your comment letter. 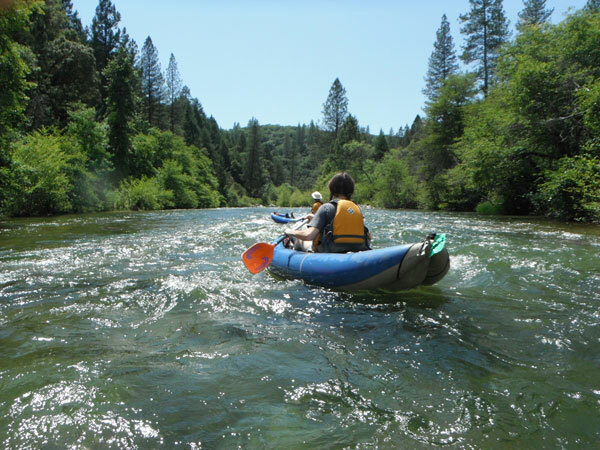 Take an opportunity to attend a workshop, and get out on the Bear River on one of the weekend afternoon tours at the Bear River Campground Day Use Parking Lot, where an information booth will be set up to provide materials and self-guided maps of the hiking trail network along the river. 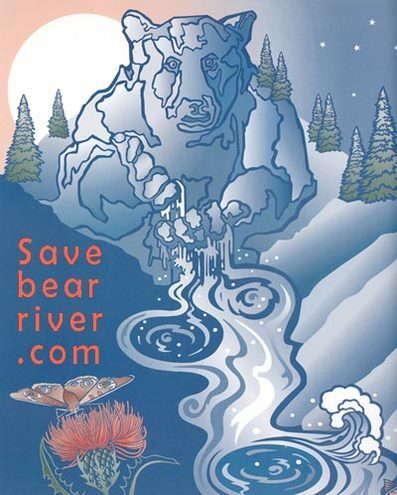 Don't miss the Bear River gang at the PARC Wild & Scenic Festival this coming Saturday, March 18th.... with the premier of "Voice of the Bear River", the debut of a new folk/rap song about the Bear, and Nisenan spokespersons speaking from the heart. Letters must be submitted by April 10. Please attend a meeting to stay informed and learn more about writing your comment letter. Click below to view schedules of public meetings, workshops and tours.